Are there any game franchises as meta as Paper Mario? The Super Mario spinoff launched back in 2000 by literally splitting the difference between the original 2D sibling side-scrollers of the 1980s and their subsequent 1990s 3D platformer counterparts. 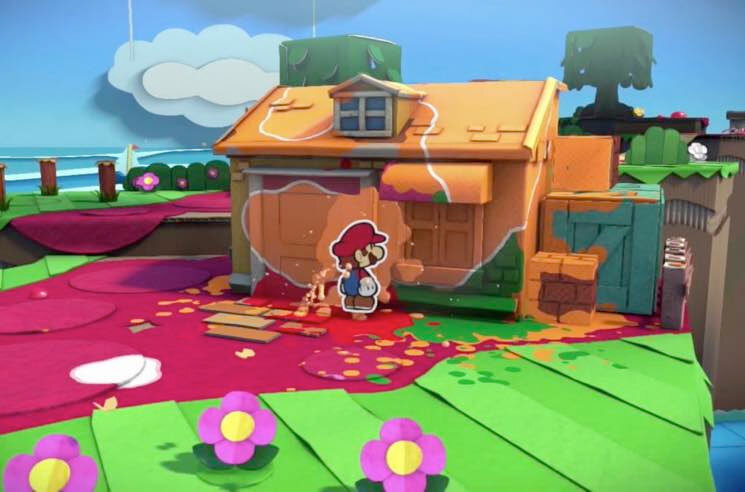 Color Splash continues the series' fundamentals by having 2D "Paper" versions of Mario, Peach and Toad visiting a multidimensional world — in this case Prism Island — that is being drained of its color. There, Mario meets his local travel companion Huey, a very chatty paint can. Fittingly, the plot is paper-thin. The art direction here pushes the paper concept even further than usual, as the world is done in diorama papercraft style. Though the look was used in the lower-res 3DS game Paper Mario: Sticker Star, and more thoroughly by Media Molecule on Tearaway, it's a real beaut here with the use of virtual corrugated cardboard, construction paper, tape and even fishing line to hold up flying objects like clouds. It also provides a perfect paper counterpart to the textile-based Yoshi's Woolly World and Kirby's Epic Yarn. In an era when people are going for photorealism or controllable cartoons, it's nice to see Nintendo nailing these arts'n'crafts graphic approaches that use the tech while toying with the artifice of game design. This is especially true here because Paper Mario games have always deconstructed the medium in general and Nintendo specifically, albeit in a loving, jokey way. Speaking of, the self-aware script leans heavily on corny comedy and trope in-jokes, so either you'll be amused or you'll be thumb-pressing through the dialogue as fast as you can. Color Splash is an action-adventure lite-RPG, but it's not really a platformer, so while you'll see the same Mushroom Kingdom creatures, question mark boxes and whatnot, jumping and running takes a backseat to paint-powered exploring and turn-based fighting. The former will see you using a hammer to re-paint areas of the worlds that have been drained by Bower's bad guys, while the latter is card-based combat of the JRPG variety. I generally prefer real-time fighting, and this strategic system wasn't enough to change my mind.